Around Lake Kariba, Zimbabwe. The motivation for our 2000 trip to Zimbabwe was to view a total eclipse of the sun, which we did from a location near Lake Kariba, on a perfectly clear day. In fact we were situated on a river bank, just across from Zambia, and right next to a clan of hippos who didn't seem to take much notice of us or the eclipsed sun. John, our safari guides from Wilderness Lodge (see below) joined us for the eclipse watch and took us on a visit of his sister's village afterwards. We almost didn't go to Zimbabwe because of US State Department warning on the unstable political and economical situation there. We were about to go with alternative plans in neighboring Zambia. But just a week or two before our planned departure our friend Jerry returned from her own jaunt to Zimbabwe with a report that all's well there for tourism. In other words don't take the State Department warning too seriously. In fact it was an opportune time to visit Zimbabwe because tourists were scared off making accommodations easier to find and a lot cheaper than usual, even in the most elegant safari resorts. Upon landing in Harare we were approached by a genetleman representing Rejoice Car Hire. He offered us a 4WD at a much better price than the rental agencies in the airport. We went with him to downtown to negotiate the deal and take possession of the car. The car turned out to be somewhat of a lemon (bare skin tires etc) but the transaction was otherwise pleasant and profitable and we did make it (with some "adventures") to the end. Our Zimbabwe experience was entirely around Lake Kariba area which offered a great variety of possibilities, including several variations of the African Safari experiences. Here was our itinerary - and if we had it to do over again we would do it exactly the same way. 1st night: we acclimated into the neighborhood at the Caribbea Bay Hotel, Kariba. Dinner on the hotel veranda was most enjoyable. 2nd day: shopped for Shawnee stones. The artists were selling them at roadside shops near the Caribbea Bay Hotel. (There was a second chance to buy stones at Victoria Falls at the end of the trip - but prices were higher.) We bought a fair number of stone statues, which we shipped home a week later with a professional and very efficient shipping company in Victoria Falls, Cargo Marketing International (managed by Heather Fynn). Days 3-5: Ferried to Wilderness Lodge [***, $$] for a 3-night stay on lake cabin (see photos at right). Individual "honeymoon" cabins float on pontoons. Guests are taken to dropped off and picked up form their cabins by canoe. Meals are served on the mother ship -- another larger floating boat. The mother ship also has rooms, which are lovely, but we recommend the remote individual cabins for the ultimate romance and experience. We slept surrounded by water and wildlife. Lion roars and other jungle sounds keeping us up at night. Early morning and evening walking safari on and near the lake with the Wilderness Lodge guides. 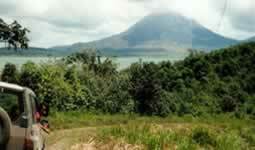 Walking safaris, as we discovered, are much more interesting and intimate contact with the jungle than jeep rides. Sunset canoeing on Lake Kariba, getting very close to hippos. This is where we met our very able guide John who later joined us for the solar eclipse. Days 6-9: We drove a long dusty road from Kariba to the Chizarira Wilderness Lodge [***,$$], Chirzarira NP. The drive was longer than expected and we arrived after sunset. On the final climb to the lodge we had our first rental car adventure: the car suddenly quit in the jungle. It was now pitch black. Imagine how scary that was. Fortunately we thought to look under the hood and found that the problem was simply a loose battery cable. We fixed that and were good to go. We arrived at the lodge very very late, but the hosts and one other couple that was staying there were holding dinner for our arrival. They knew we were close because they saw our headlights in the distance. So when we arrived they started the cocktail hour and then dinner, the first of many scrumptious culinary meals planned by our talented and imaginative hostess (where did she find the ingredients out there in the middle of nowhere) and prepared by her staff. And words can not describe the magnificent open air dinning, the bar, and accommodations. There were two or three organized safari expeditions each day. Days 10-11: Tent safari in Hwang. Getting there was another long day of dusty road driving and another min-adventure with the car: one of the tires burst. But just then about twenty natives came out of nowhere (or literally from out of the trees) to help us mount a replacement and we were again on the way. Hwang is the biggest, most accessible safari park, and more touristy. We didn't like it as much as the above two lodges. On the other hand this is the best place to see huge herds of elephants. Days 12-13: Continuing drive, now on a good paved highway to Victoria Falls. Another tire began loosing air, but thankfully held until just arrived at our next hotel. We stayed at the Victoria Falls Hotel [***] and walked over to Victoria Falls where we got a soaked in spray. There were few guests at the hotel so we got the best room at rock bottom price, about $100/night - but under normal circumstances (that is, a stable government) the same room would probably have fetched $300-500. Our room looked out on the bridge. Elegant and romantic dinners were served on the veranda. On the second day we did the walk over the bridge to Zambia. On the third day we took a flight out of Victoria Falls airport to Johannesburg, SA, and then home. TRIP TIP 1. Drive or fly? We did the round-Kariba tour in the rented 4WD. There is also an option to fly in small chartered planes from location to location. Driving took us through many remote villages and interesting encounters. But next time we'll fly. TRIP TIP 2. Safari Lodges are expensive when booked through Internet travel agents. The places we stayed at were promoted at $300-$500 per night PER PERSON. Fortunately we didn't make reservations ahead and when we arrive at Zimbabwe we discovered that we could easily make our reservations a day or two ahead by phone or just walk-in (as we did at Victoria Falls). Prices were negotiable in the local and devalued currency. We paid closer to $50 per night/person at most place. Of course part of the reason we could get such bargains was that the political situation in the country was scaring tourists away. There was plenty of vacancy everywhere. For example: we were one of six couples staying at the Victoria Hotel. The hotel has a capacity for hundreds. Wildness Lodge: Tea and biscuits service arrives by canoe before breakfast. The canoe comes back an hour later to pick you up for breakfast and day activities, which include a morning and afternoon walking safaris. The staff will also take you in a canoe for close encounter with hippos. Imagine you in a canoe, 10 feet from a group of hippos, with the sun setting over the lake. Your courage perhaps fortified by a nice Chardonnay, but also (more importantly) by your complete confidence at the skill and experience of your Wilderness Lodge guides. Cabin at Wilderness Lodge. You are ferried over to your cabin in the evening and left alone overnight with the wildlife. No escaping until they return to pick you up for breakfast and day activities. Although Victoria Falls was spectacular, the Wilderness Lodge and Chizarira were the most memorable places we visited of this trip. Both spectacular experiences. Not to be missed. Above: One of our Wilderness Lodge guides; John, another Wilderness Lodge guide, took us to visit his sister's village; children met in another village on the back road to Chizarira . Left: John's clan. Can you spot Marlene in this village group photo?